'06 Oct 22 Israel admits phosphorus bombing Israel has for the first time admitted it used controversial phosphorus bombs during fighting against Hezbollah in Lebanon in July and August..... Israel had previously said the weapons were used only to mark targets...... Phosphorus weapons cause chemical burns and the Red Cross and human rights groups say they should be treated as chemical weapons....... The Geneva Conventions ban the use of white phosphorus as an incendiary weapon against civilian populations and in air attacks against military forces in civilian areas. 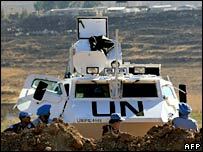 '06 Oct 22 Unifil head hints at use of force The commander of UN peacekeepers in Lebanon (Unifil) has suggested the use of force to stop continuing Israeli violations of Lebanese airspace.....But French Gen Alain Pellegrini said this would require the UN to change the rules of engagement for its troops. He said that Israeli air incursions were a "clear violation of the UN Security Council 1701.... "They are not to be accepted. Every time these occur, we report them first to the [UN] secretary general immediately and we protest to the Israelis"....... He said France had deployed anti-aircraft missiles to Lebanon but under current rules could only use them to protect its own soldiers.